Diamond Select Toys is a pretty great company. They are nothing if not persistent, and often go several extra miles in order to placate fans' desires. When many companies would have simply dropped the Battlestar Galactica line, DST has pushed as hard and as long as they could. However, despite their dedication, they don't always make the best decisions. 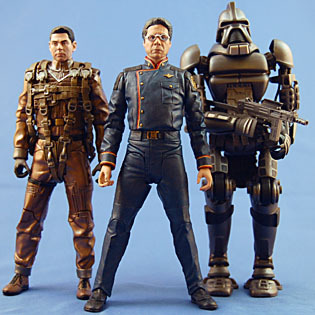 Much has been made about the third series of BSG figures which was comprised solely of characters (or versions of characters) that appeared in the first, and remarkably underwhelming, BSG direct-to-DVD film Razor. As a result slots in the line were "wasted" on low- or no-demand figures at a time of peak interest in the franchise, leaving us now with the line essentially dead and no Laura Roslin, Gaius Baltar, Brother Cavil, and so on, in our collections. Fortunately, one of the last releases is Bill Adama, the patriarch of the series and arguably the biggest whole in the collection to date. Series 4 of this line has been much maligned. After the "disaster" of Series 3 it took a remarkable length of time even to be announced, and was revealed to be Commander Adama, Laura Roslin, President Apollo and Admiral Cain. It lingered there for the better part of a year before being canceled due to poor pre-sales (the fault of a problematic lineup with the blame predominantly at President Apollo's inclusion) and reworked to feature Mustachioed Adama, Admiral Cain and President Baltar. By this time the waves of Toys Я Us exclusive figures had become a much-welcome, much-needed, and much-expected outlet for additional BSG figures. Regular non-mustachioed Adama was assigned to Series 5. This was a semi-controversial move. On the one hand, seeing has Series 4 had already been cancelled once, this seemed the most "sure bet" way to get what is effectively "signature" (meaning the most recognizable look) Adama to our hands. On the other side, it definitively took him out of the hands of many collectors. The TRU exclusives are rarely available outside of the US, and moreover, DST's TRU exclusive figures are notoriously hard to get. Again, despite their best intentions, DST makes bad decisions often seriously shortpacking the exclusive and/or fan-demanded figures. Case in point, if what I saw in Toys Я Us is accurate, Series 5 is a six-figure case packed with five Stealth Cylon Warriors and one Adama. One Adama. Five not-on-screen repaints. Un. Be. Liev. Able. A career soldier and brilliant tactician, William Adama commands the Battlestar Galactica and her crew with experienced hands of both an officer and a father. His promise to find Earth, once merely a fantasy, has now become his driving goal. 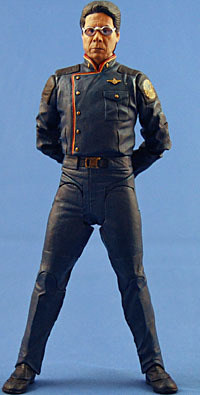 Surprisingly, the figure is almost an entirely new sculpt (sharing only the arms originally made for his son, Apollo). DST bought Art Asylum about two years ago and has been using that "brand" and website as a pretty substantial public blog. Among the many great features they've run they have one titled "Sculpting BSG Series 4" which details in words and pictures the sculpting of the ill-fated Series 4, including ol' Bill Adama here. It's definitely worth the read and more insightful than what I could provide here. (Despite the images showing the re-use of Helo's legs what I have in my hands here are definitely from a different tooling/mold) One of the things they do bring up: which version of Adama to do? Over the course of the show he's had two ranks, two facial hair styles, a handful of haircuts and an ever-growing waistline. What's interesting is that the show covers enough time, and certainly its airing was dragged out long enough, that the weight and hairstyle changes didn't even register to me, but going back, boy does "Daybreak" Adama look different than "Mini-Series" Adama! Ultimately DST did a really good job of selecting a sort of pan-look Adama which serves quite well as what is probably the only Adama (at least bodytype) that we'll get. However, that is related to the only real flaw with the figure, aside from difficulty to locate and his feet being a bit too far apart, the likeness isn't very strong. Apart from the Jean St. Jean/RealScanned genius of the Stargate line, DST is not ranked very high in the "dead-on likeness" category within the industry. The BSG line seems to fluctuate between "pretty good" and "okay," often having the sense of... the best way for me to describe it is having a dead-on likeness just under the surface, almost as if there were a great laser-scan of the actor that a sculptor then added or subtracted too much from. Adama here has the intangible sense of being sculpted purely by hand, and as such, seems to lack some of the sharpness of the rest of the line. 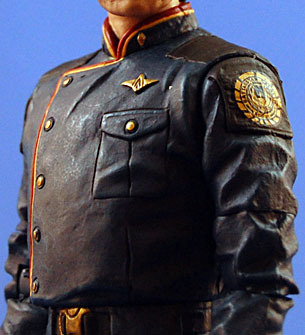 I can't quite place my finger on it on the issue(s) but I can tell this figure is William Adama though I can't tell that it's Edward James Olmos. Fortunately though, it isn't a strong enough problem to really turn me away from the figure - it's just the one downside to an otherwise great addition. Like the rest of the figures, the old man comes with 20 points of articulation: balljoint ankles, hinge knees, swivel thighs, side-hinged hips on a T-crotch (like DCU), balljoint wrists, hinge elbows, swivel biceps, balljoint shoulders, swivel wrist and balljoint head. Like most DST releases he also comes with a load of accessories. 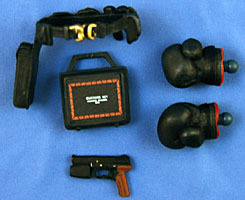 We have, a gun belt, gun, boxing gloves and a Munitions Key box. These are all recycled from previous releases but are all very welcome and appreciated. There is actually one more accessory which also gives this figure his official variation name: his glasses. Trademark to the Old Man of Galactica are his spectacles and he sports them here. Glasses are notoriously hard to pull off convincingly on figures, especially the smaller the toy is. My best friend thinks the glasses ruin this figure but they work just fine for me. The frames are a little too thick and the paint bleeds over onto the left lens on my figure, but I can easily accept the difficulty of glasses at this scale and, to be honest, its not like the likeness is that great to begin with. DST went the route of pegholes for the glasses rather than having them rest over the ears, a choice I support in this instance. The only problem would be that head would have two holes on either temple if the glasses were removed - which, for better or worse, they can't be. They're thin and feel fragile enough that I don't want to risk breaking them but I have given them significant force and they will not pull out. Not a problem for me - but those after the non-bespectacled look beware. As much as it pains me, there is a really good chance this is the last new character to be released (we're only waiting on the Boomer/Sharon 2-pack to ship before the future rests squarely on the shoulders of Series 4) and it is a must-have for the collection and a good figure to boot. If you can find buy him, you won't be disappointed. And if you were concerned, I was particularly complaining about the Pegasus Gina and Kendra Shaw from Razor being made before more important characters.